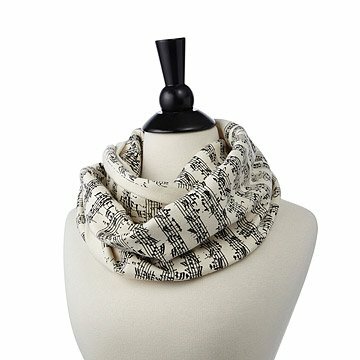 This noteworthy infinity scarf is screenprinted with the image of handwritten sheet music. It's easy to get all wrapped up in a moving classical melody, and with these infinity scarves, you can get wrapped up in the graphically-gorgeous notation behind the music. With musical manuscripts hand illustrated by Tori Tissell, each circular scarf is silkscreened with beloved compositions. Because they are printed on both sides, the notes will overlap in intriguing folds when you layer it. You can almost feel the music’s expression in the faithful reproduction of the composer’s hand-written musical notation. These great transitional scarves are made from medium-weight cotton knit, with a comfy, t shirt-like texture that keeps out the chill without being too heavy. Hand printed in Portland, OR. Pictured: Left: J.S. Bach's "Chaconne for Violin." Right: Madame Butterfly. Make it a set! Click here to see our Literary Writing Gloves. See more scarves in musical and literary themes by Tori Tissel here. Spot treat recommended or a gentle wash cycle in cool water. Hang or lay flat to dry. Warm iron ok and it is safe to iron on the print. This is great for the cooler/cold weather, and so different that one can be unique. I'm sure she will use it often. I bought a denim jacket with embroideried flowers on it. I have always liked music notes and flowers together. I thought it might look nice together. My mother loved this item. My niece has said it's too pretty to wear all the time. So she wears it for for formal occassions. And for every band or choral event! It is a fairly unique gift, and appropriate for anyone with a musical background or is a performer. She said it was soft and warm, so it's good. She loved it. She used to sing Un Bel Di, so this was a perfect unusual gift, which is what I was looking for. I will definitely shop here again.